Brackish water is water having more salinity than freshwater, but not as much as seawater. It may result from mixing seawater with fresh water together, as in estuaries, or it may occur in brackish fossil aquifers. The word comes from the Middle Dutch root "brak". Certain human activities can produce brackish water, in particular civil engineering projects such as dikes and the flooding of coastal marshland to produce brackish water pools for freshwater prawn farming. 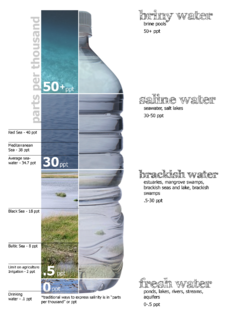 Brackish water is also the primary waste product of the salinity gradient power process. Because brackish water is hostile to the growth of most terrestrial plant species, without appropriate management it is damaging to the environment. A flagellum is a lash-like appendage that protrudes from the cell body of certain bacteria and eukaryotic cells termed as flagellates. A flagellate can have one or several flagella. The primary function of a flagellum is that of locomotion, but it also often functions as a sensory organelle, being sensitive to chemicals and temperatures outside the cell. The similar structure in the archaea functions in the same way but is structurally different and has been termed the archaellum. A pilus is a hair-like appendage found on the surface of many bacteria. The terms pilus and fimbria can be used interchangeably, although some researchers reserve the term pilus for the appendage required for bacterial conjugation. All pili in the latter sense are primarily composed of pilin proteins, which are oligomeric. Cholera toxin is AB5 multimeric protein complex secreted by the bacterium Vibrio cholerae. CTX is responsible for the massive, watery diarrhea characteristic of cholera infection. It is a member of the Heat-labile enterotoxin family. Proteins are large biomolecules, or macromolecules, consisting of one or more long chains of amino acid residues. Proteins perform a vast array of functions within organisms, including catalysing metabolic reactions, DNA replication, responding to stimuli, providing structure to cells and organisms, and transporting molecules from one location to another. Proteins differ from one another primarily in their sequence of amino acids, which is dictated by the nucleotide sequence of their genes, and which usually results in protein folding into a specific three-dimensional structure that determines its activity. When visiting areas with epidemic cholera, the following precautions should be observed: drink and use bottled water; frequently wash hands with soap and safe water; use chemical toilets or bury feces if no restroom is available; do not defecate in any body of water and cook food thoroughly. A single dose vaccine is available for those traveling to an area where cholera is common. Cholera vaccines are vaccines that are effective at preventing cholera. For the first six months after vaccination they provide about 85 percent protection, which decreases to 50 percent or 62 percent during the first year. After two years the level of protection decreases to less than 50 percent. When enough of the population is immunized, it may protect those who have not been immunized. 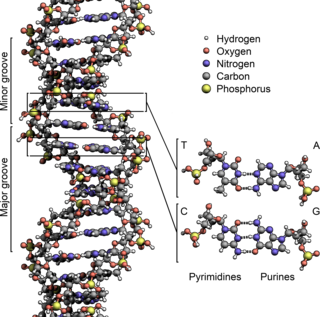 Deoxyribonucleic acid is a molecule composed of two chains that coil around each other to form a double helix carrying the genetic instructions used in the growth, development, functioning, and reproduction of all known organisms and many viruses. DNA and ribonucleic acid (RNA) are nucleic acids; alongside proteins, lipids and complex carbohydrates (polysaccharides), nucleic acids are one of the four major types of macromolecules that are essential for all known forms of life. In virology, temperate refers to the ability of some bacteriophages to display a lysogenic life cycle. Many temperate phages can integrate their genomes into their host bacterium's chromosome, together becoming a lysogen as the phage genome becomes a prophage. A temperate phage is also able to undergo a productive, typically lytic life cycle, where the prophage is expressed, replicates the phage genome, and produces phage progeny, which then leave the bacterium. With phage the term virulent is often used as an antonym to temperate, but more strictly a virulent phage is one that has lost its ability to display lysogeny through mutation rather than a phage lineage with no genetic potential to ever display lysogeny. A bacteriophage, also known informally as a phage, is a virus that infects and replicates within bacteria and archaea. The term was derived from "bacteria" and the Greek φαγεῖν (phagein), "to devour". Bacteriophages are composed of proteins that encapsulate a DNA or RNA genome, and may have relatively simple or elaborate structures. Their genomes may encode as few as four genes and as many as hundreds of genes. Phages replicate within the bacterium following the injection of their genome into its cytoplasm. Bacteriophages are among the most common and diverse entities in the biosphere. Bacteriophages are ubiquitous viruses, found wherever bacteria exist. It is estimated there are more than 1031 bacteriophages on the planet, more than every other organism on Earth, including bacteria, combined. 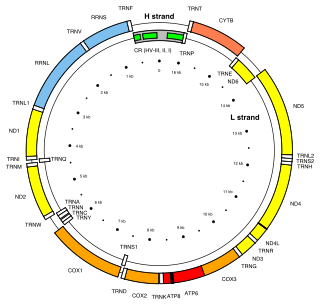 A plasmid is a small DNA molecule within a cell that is physically separated from chromosomal DNA and can replicate independently. They are most commonly found as small circular, double-stranded DNA molecules in bacteria; however, plasmids are sometimes present in archaea and eukaryotic organisms. In nature, plasmids often carry genes that benefit the survival of the organism, such as by providing antibiotic resistance. While the chromosomes are big and contain all the essential genetic information for living under normal conditions, plasmids usually are very small and contain only additional genes that may be useful in certain situations or conditions. Artificial plasmids are widely used as vectors in molecular cloning, serving to drive the replication of recombinant DNA sequences within host organisms. In the laboratory, plasmids may be introduced into a cell via transformation. Mitochondrially encoded 16S RNA is a mitochondrial ribosomal RNA (rRNA) that in humans is encoded by the MT-RNR2 gene. The MT-RNR2 gene also encodes the Humanin polypeptide that has been the target of Alzheimer's disease research. A replicon is a DNA molecule or RNA molecule, or a region of DNA or RNA, that replicates from a single origin of replication. V. cholerae contains a genomic island of pathogenicity and is lysogenized with phage DNA. That means that the genes of a virus were integrated into the bacterial genome and made the bacteria pathogenic. The molecular pathway involved in expression of virulence is discussed in the pathology and current research sections below. A symbiotic relationship between V. cholerae and Ruminococcus obeum has been determined. R. obeum autoinducer represses the expression of several V. cholerae virulence factors. This inhibitory mechanism is likely to be present in other gut microbiota species which opens the way to mine the gut microbiota of members in specific communities which may utilize autoinducers or other mechanisms in order to restrict colonization by V. cholerae or other enteropathogens. Two serogroups of V. cholerae, O1 and O139, cause outbreaks of cholera. O1 causes the majority of outbreaks, while O139 – first identified in Bangladesh in 1992 – is confined to Southeast Asia. Many other serogroups of V. cholerae, with or without the cholera toxin gene (including the nontoxigenic strains of the O1 and O139 serogroups), can cause a cholera-like illness. Only toxigenic strains of serogroups O1 and O139 have caused widespread epidemics. V. cholerae O1 has two biotypes, classical and El Tor, and each biotype has two distinct serotypes, Inaba and Ogawa. The symptoms of infection are indistinguishable, although more people infected with the El Tor biotype remain asymptomatic or have only a mild illness. In recent years, infections with the classical biotype of V. cholerae O1 have become rare and are limited to parts of Bangladesh and India. Recently, new variant strains have been detected in several parts of Asia and Africa. Observations suggest these strains cause more severe cholera with higher case fatality rates. El Tor is a particular strain of the bacterium Vibrio cholerae, the causative agent of cholera. Also known as V. cholera biotype eltor, it has been the dominant strain in the seventh global cholera pandemic. It is distinguished from the classic strain at a genetic level, although both are in the serogroup O1 and both contain Inaba, Ogawa and Hikojima serotypes. It is also distinguished from classic biotypes by the production of hemolysins. Vibrio is a genus of Gram-negative bacteria, possessing a curved-rod shape, several species of which can cause foodborne infection, usually associated with eating undercooked seafood. Typically found in salt water, Vibrio species are facultative anaerobes that test positive for oxidase and do not form spores. All members of the genus are motile and have polar flagella with sheaths. Vibrio species typically possess two chromosomes, which is unusual for bacteria. Each chromosome has a distinct and independent origin of replication, and are conserved together over time in the genus. Recent phylogenies have been constructed based on a suite of genes. Pathogenicity islands (PAIs), as termed in 1990, are a distinct class of genomic islands acquired by microorganisms through horizontal gene transfer. Pathogenicity islands are found in both animal and plant pathogens. Additionally, PAIs are found in both gram-positive and gram-negative bacteria. They are transferred through horizontal gene transfer events such as transfer by a plasmid, phage, or conjugative transposon. Therefore, PAIs contribute to microorganisms' ability to evolve. Vibrio parahaemolyticus is a curved, rod-shaped, Gram-negative bacterium found in brackish, saltwater, which, when ingested, causes gastrointestinal illness in humans. V. parahaemolyticus is oxidase positive, facultatively aerobic, and does not form spores. Like other members of the genus Vibrio, this species is motile, with a single, polar flagellum. The RTX toxin superfamily is a group of cytolysins and cytotoxins produced by bacteria. There are over 1000 known members with a variety of functions. The RTX family is defined by two common features: characteristic repeats in the toxin protein sequences, and extracellular secretion by the type I secretion systems (T1SS). The name RTX refers to the glycine and aspartate-rich repeats located at the C-terminus of the toxin proteins, which facilitate export by a dedicated T1SS encoded within the rtx operon. Shah Mohammad Faruque is a professor in the School of Life Sciences at Independent University Bangladesh (IUB). He is widely recognized for his research in Vibrio cholerae, the bacterium which causes the epidemic diarrhoeal disease Cholera. Among other positions, previously he was a professor at BRAC University; director of the Genomics Centre at the International Centre for Diarrhoeal Disease Research, Bangladesh (ICDDR,B), and formerly director of the Centre for Food and Water Borne Diseases in ICDDR,B. His areas of interest include microbial genomics, bacteriophages, environmental microbiology, ecology, and evolution of bacterial pathogens, particularly those associated with waterborne and foodborne diseases. Faruque is well known for his work on molecular genetics, epidemiology and ecology of the cholera pathogen, and its bacteriophages. In molecular biology, the heat-labile enterotoxin family includes Escherichia coli heat-labile enterotoxin (Elt) and cholera toxin (Ctx) secreted by Vibrio cholerae. SaPIs are a family of mobile genetic elements resident in the genome of some strains of Staphylococcus aureus. Much like bacteriophages, SaPIs can be transferred to uninfected cells and integrate into the host chromosome. Unlike the bacterial viruses, however, integrated SaPIs are mobilized by host infection with "helper" bacteriophages. The CTXφ bacteriophage is a filamentous bacteriophage that contains the genetic material needed by the Vibrio cholerae bacterium for the production of cholera toxin, or CT. CTXφ is a positive virus with single-stranded DNA (ssDNA). Vibrio campbellii is a Gram-negative, curved rod-shaped, marine bacterium closely related to its sister species, Vibrio harveyi. It is an emerging pathogen in aquatic organisms. In molecular biology, Vibrio cholerae ToxT activated RNAs are small RNAs which are produced by the bacterium Vibrio cholerae. They are regulated by the transcriptional activator ToxT and may play a role in V. cholerae virulence. Two ToxT activated RNAs have been described: TarA and TarB. The type VI secretion system (T6SS) is molecular machine used by a wide range of Gram-negative bacterial species to transport proteins from the interior of a bacterial cell across the cellular envelope into an adjacent target cell. While often reported that the T6SS was discovered in 2006 by researchers studying the causative agent of cholera, Vibrio cholerae, the first study demonstrating that T6SS genes encode a protein export apparatus was actually published in 2004, in a study of protein secretion by the fish pathogen Edwardsiella tarda. Blautia obeum is a species of anaerobic, gram-positive bacteria found in the gut. VqmR small RNA was discovered in Vibrio cholerae, a bacterium which can cause cholera, using differential RNA sequencing (sRNA-seq) under conditions of low and high cell density which were being used to study quorum sensing (QS). QS controls virulence and biofilm formation in Vibrio cholerae; it has been shown previously that it is directed by the Qrr sRNAs. VqmR has been shown to repress the expression of multiple mRNAs including the rtx toxin genes and the vpsT, which is required for biofilm formation. In fact, VqmR which is highly conserved in vibrionaceae, was shown to strongly inhibit biofilm formation by repressing the vpsT gene; it could be the link between biofilm formation and QS. Contact-dependent growth inhibition (CDI) is a phenomenon where a bacterial cell may deliver a polymorphic toxin molecule into neighbouring bacterial cells upon direct cell-cell contact, causing growth arrest or cell death. 1 2 3 4 5 6 7 "Laboratory Methods for the Diagnosis of Vibrio cholerae" (PDF). Centre for Disease Control. Retrieved 29 October 2013. Filippo Pacini (1854) "Osservazioni microscopiche e deduzioni patologiche sul cholera asiatico" (Microscopic observations and pathological deductions on Asiatic cholera), Gazzetta by tiadwe Medica Italiana: Toscana, 2nd series, 4 (50) : 397-401 ; 4 (51) : 405-412. The term "vibrio cholera" appears on page 411. Reprinted (more legibly) as a pamphlet. ↑ Bentivoglio, M; Pacini, P (1995). "Filippo Pacini: A determined observer" (PDF). Brain Research Bulletin. 38 (2): 161–5. CiteSeerX 10.1.1.362.6850 . doi:10.1016/0361-9230(95)00083-Q. PMID 7583342. 1 2 3 4 5 6 7 8 9 Howard-Jones, N (1984). "Robert Koch and the cholera vibrio: a centenary". BMJ. 288 (6414): 379–81. doi:10.1136/bmj.288.6414.379. PMC 1444283 . PMID 6419937. ↑ Davis, B; Waldor, M. K. (February 2003). "Filamentous phages linked to virulence of Vibrio cholerae". Current Opinion in Microbiology. 6 (1): 35–42. doi:10.1016/S1369-5274(02)00005-X. PMID 12615217. ↑ Boyd, EF; Waldor, MK (Jun 2002). "Evolutionary and functional analyses of variants of the toxin-coregulated pilus protein TcpA from toxigenic Vibrio cholerae non-O1/non-O139 serogroup isolates". Microbiology. 148 (Pt 6): 1655–66. doi:10.1099/00221287-148-6-1655. PMID 12055286. ↑ Miller, Melissa B.; Skorupski, Karen; Lenz, Derrick H.; Taylor, Ronald K.; Bassler, Bonnie L. (August 2002). "Parallel Quorum Sensing Systems Converge to Regulate Virulence in Vibrio cholerae". Cell. 110 (3): 303–314. doi:10.1016/S0092-8674(02)00829-2. PMID 12176318. ↑ Nielsen, Alex Toftgaard; Dolganov, Nadia A.; Otto, Glen; Miller, Michael C.; Wu, Cheng Yen; Schoolnik, Gary K. (2006). "RpoS Controls the Vibrio cholerae Mucosal Escape Response". PLoS Pathogens. 2 (10): e109. doi:10.1371/journal.ppat.0020109. PMC 1617127 . PMID 17054394. 1 2 Faruque, SM; Albert, MJ; Mekalanos, JJ (Dec 1998). "Epidemiology, genetics, and ecology of toxigenic Vibrio cholerae". Microbiology and Molecular Biology Reviews. 62 (4): 1301–14. PMC 98947 . PMID 9841673. ↑ Fraser, Claire M.; Heidelberg, John F.; Eisen, Jonathan A.; Nelson, William C.; Clayton, Rebecca A.; Gwinn, Michelle L.; Dodson, Robert J.; Haft, Daniel H.; et al. (2000). "DNA sequence of both chromosomes of the cholera pathogen Vibrio cholerae" (PDF). Nature. 406 (6795): 477–83. doi:10.1038/35020000. PMID 10952301. ↑ McLeod, S. M.; Kimsey, H. H.; Davis, B. M.; Waldor, M. K. (2005). "CTXφ and Vibrio cholerae: exploring a newly recognized type of phage-host cell relationship". Molecular Microbiology. 57 (2): 347–356. doi:10.1111/j.1365-2958.2005.04676.x. PMID 15978069. ↑ Robins, WP; Mekalanos, JJ (2014). Genomic science in understanding cholera outbreaks and evolution of Vibrio cholerae as a human pathogen. Current Topics in Microbiology and Immunology. 379. pp. 211–29. doi:10.1007/82_2014_366. ISBN 978-3-642-55403-2. PMC 4153709 . PMID 24590676. ↑ Lutz, Carla; Erken, Martina; Noorian, Parisa; Sun, Shuyang; McDougald, Diane (2013). "Environmental reservoirs and mechanisms of persistence of Vibrio cholerae". Frontiers in Microbiology. 4: 375. doi:10.3389/fmicb.2013.00375. ISSN 1664-302X. PMC 3863721 . PMID 24379807. ↑ Faruque, SM; Nair, GB (2002). "Molecular ecology of toxigenic Vibrio cholerae". Microbiology and Immunology. 46 (2): 59–66. doi:10.1111/j.1348-0421.2002.tb02659.x. PMID 11939579. ↑ Siddique, A.K. ; Baqui, A.H.; Eusof, A.; Haider, K.; Hossain, M.A. ; Bashir, I.; Zaman, K. (1991). "Survival of classic cholera in Bangladesh". The Lancet. 337 (8750): 1125–1127. doi:10.1016/0140-6736(91)92789-5. 1 2 Meibom KL, Blokesch M, Dolganov NA, Wu CY, Schoolnik GK (2005). "Chitin induces natural competence in Vibrio cholerae". Science. 310 (5755): 1824–7. Bibcode:2005Sci...310.1824M. doi:10.1126/science.1120096. PMID 16357262. ↑ Matthey N, Blokesch M (2016). "The DNA-Uptake Process of Naturally Competent Vibrio cholerae". Trends Microbiol. 24 (2): 98–110. doi:10.1016/j.tim.2015.10.008. PMID 26614677. ↑ quintdaily (3 August 2017). "Vibrio Cholera Starts Spreading In India – QuintDaily". 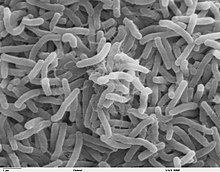 Wikimedia Commons has media related to Vibrio cholerae .